Stylish design and practical features merge beauty and function in these ready to assemble cubes with doors. Sleek, round corners allow for smooth edges, while the windowed door keeps contents neatly disguised. Inside shelf is adjustable to suit different storage needs. Arrange compact cubes in a horizontal line or stack up to three tall to create a bedside table, bookshelf, TV stand, room partition, or freestanding cabinets. Mix and match colors and styles to customize these stackable cubes. Assembly required. Inner Dimensions: 10.75"L x 12.25"W x 12.25"H. Weight tolerance: 33 lbs. For single unit, 11 lbs. Each shelf. Rounded Corners create a sleek, modern design to add class to any room. Organize versatile boxes with Window door and shelf horizontally, or vertically stack up to 3 cubes with included stability pins. 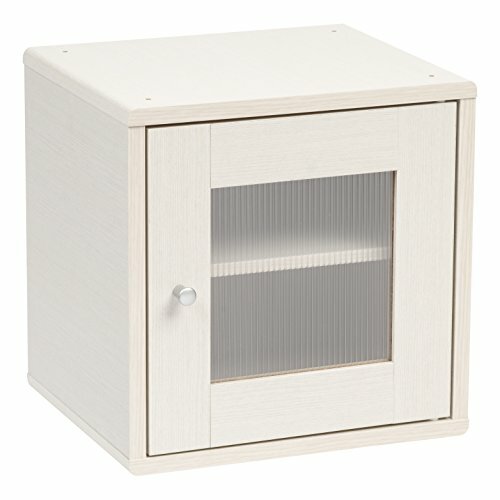 Easy to assemble storage Cube with included parts (screwdriver required). compliant with CARB regulation 93120 - Phase 2. Mix and match from multiple Styles and colors to Complement any Décor for unlimited customizable cubby storage options.